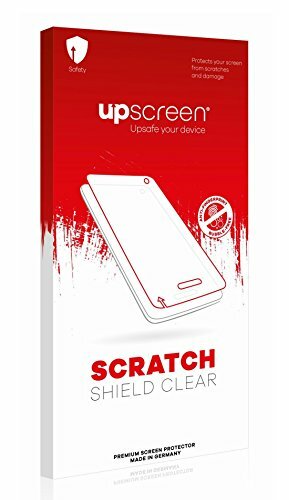 upscreen Scratch Shield Clear Premium Screen Protector provides a strong scratch protection and ensures easy cleaning due to the anti-fingerprint coating. The 94% light penetration preserves display clarity and sharpness. The new developed strong coating of your upscreen Scratch Shield Clear protects your display against scratches and damages. The oleophobic coating resists oil and smudges, reduces fingerprints and ensures easy cleaning. The multitouch optimized surface preserves the original touch experience of your device. The smooth surface of the protector ensures a pleasant touch sensation. The advanced silicon adhesive ensures an easy, bubble-free installation and a perfect adhesion. It is easily removable with no sticky residue or marks left. Your upscreen Scratch Shield Clear is manufactured in Germany with the most advanced laser technology following the highest quality standards. 1 upscreen Scratch Shield Clear Screen Protector, 1 Cleaning Wipe, 1 Smoothing Card, 1 Wet Pad, 1 Dust Remover, 3 Guide Stickers, Installation Instructions. NOTE: If your device has curved edges of the display, the film is deliberately cut smaller than the display. One package (set) contains: 1 upscreen Scratch Shield Clear Screen Protector, 1 Cleaning Wipe, 1 Smoothing Card, 1 Wet Pad, 1 Dust Remover, 3 Guide Stickers, Installation Instructions. If you have any questions about this product by Bedifol, contact us by completing and submitting the form below. If you are looking for a specif part number, please include it with your message.